You may gain strength from being with your loved ones, having a spiritual faith or pursuing your vocation. What do you do to keep returning to these things and gaining a sense of perspective? 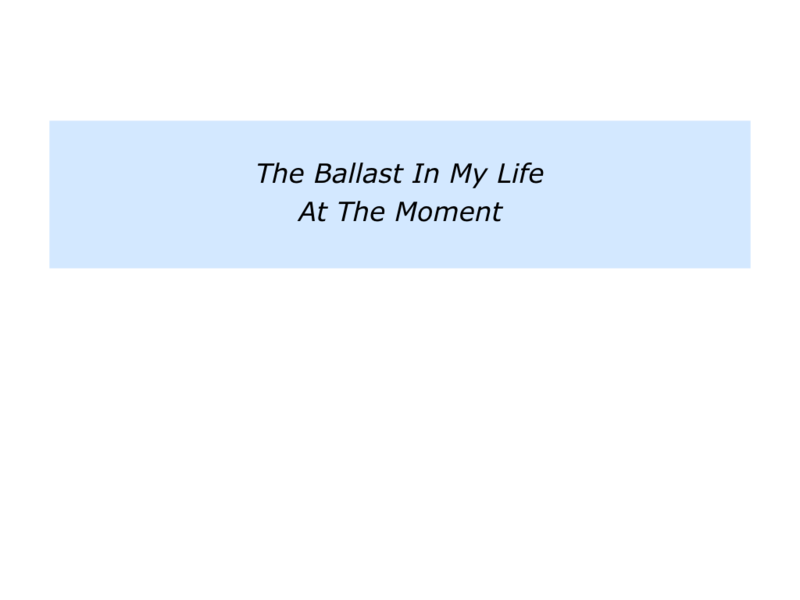 There are several definitions for the word ballast. Below are three that can be found in dictionaries. This article explores the third theme that is mentioned. 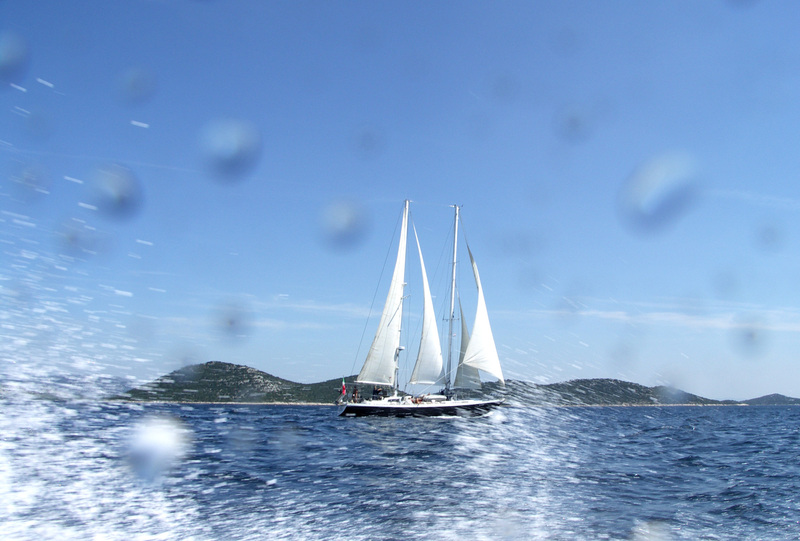 Any heavy material carried temporarily or permanently in a vessel to provide the desired stability. Something heavy, such as bags of sand, placed in the car of a balloon for control of altitude or an aircraft to control the position of the centre of gravity. Anything that gives mental or moral stability or steadiness in a person’s life. Describe the specific things that provide ballast in your life at the moment. 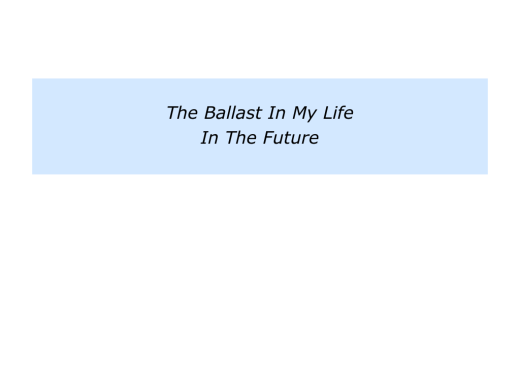 Describe the specific benefits of having these things that provide ballast in your life. 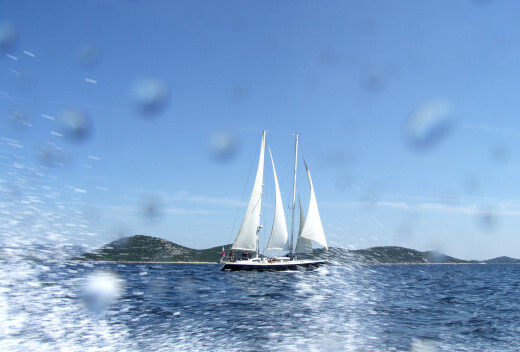 Different people have different things that provide ballast in their lives. Some talk about their loved ones, their values or their moral compass. Some talk about learning from writers such as Stephen Covey, who encouraged people to focus on what he called the Big Rocks in their lives. Some talk about going through an illness and recognising that vulnerability is a great teacher. The experience reminded them that life is precious. Remembering the lesson, they maintain a sense of gratitude in their lives. Some recover from shocks by following daily disciplines. They regain balance by returning to familiar rhythms. These may involve exercising, gardening, performing satisfying work or doing other activities. Following such disciplines brings a sense of order to their lives. 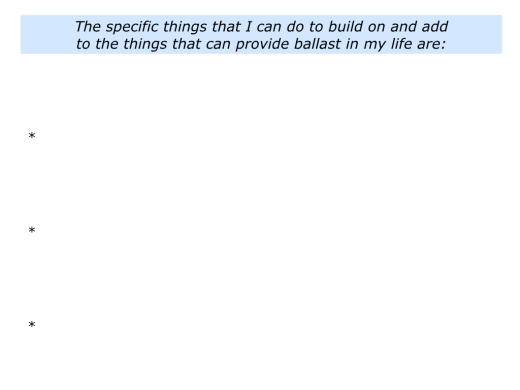 Here are some of the things that individuals have said when talking about what provides ballast in their lives. I am a soccer manager and this involves lots of ups and downs. After a bad result I go home and hug our kids. They bring me back to earth and show what is really important in life. I am a doctor in an accident and emergency unit. The work is challenging and sometimes you get violent patients. I keep returning to my medical oath and reminding myself of why I chose to be a doctor. This gives me strength to keep going, even on the toughest of Saturday nights. I try to be kind. Many years ago I reached a crucial point in my life when I could choose to be become a better person or become addicted to anger. I chose the first route and try to keep following it – one day at a time. People like to feel in control. They like to feel they can take charge of shaping their future lives. Those who have this feeling often have a greater sense of ballast in their lives. Individuals know they can only do their best, of course, and there are events they can’t control. But they can choose their attitude regarding how they respond to such events. Such people then aim to control the controllables. They build on what they can control and manage what they can’t. They do their best in the situations they meet in life. If you wish, try tackling the exercise on this theme. On a scale 0 – 10, to what extent do you feel in control of shaping your future? If appropriate, what can you do to maintain or improve the score? Recently I spoke with a friend who has taken this step in a challenging situation. She has a terminal illness and yet is providing inspiration to others. She says that she feels grateful to be able to die at home, just as she planned to do when buying her cottage. The diagnosis did not come as a shock, nor did the time frame regarding how long she had to live. People are amazed by her attitude of acceptance. On occasions she goes into the role of counselling them. As she says, however, this is a role she has often played. She feels content and is taking time to revisit the positive memories from her life. Let’s return to your own life and work. 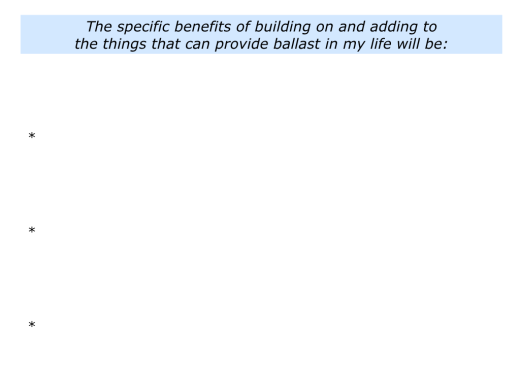 How can you continue to build on the things that provide ballast in your life? How can you add to these things? What will be the benefits of taking these steps? Describe the specific things you can do to build on and add to the things that provide ballast in your life. 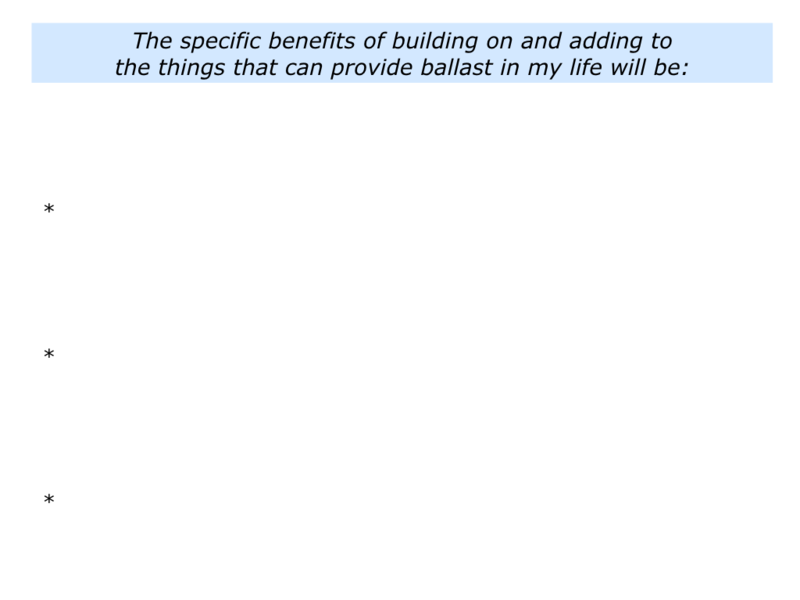 Describe the specific benefits of building on and adding to the things that provide ballast in your life.